Only hardcover, guaranteed licensed! 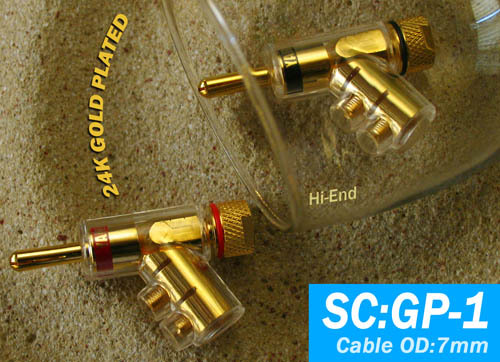 GY-GP-1 <2008 upgrade version of the gun-type plug> plated 24K thick gold, lockable connection is not easy to fall off. Better quality, better audio transmission. Applicable to OD: 7mm wire. The company to protect the interests of consumers, <YARBO AUDIOPHILE> Jubao full range of original products, has been fully enabled green genuine logo and packaging seals, enthusiasts at the time of purchase can be on the spot with the phone, SMS and Internet three ways to self-help Authenticity <at the bottom of the company's profile at the bottom there is a real check bar for enthusiasts self-help verification. > At the same time in the purchase also need to pay attention to the original color seal seal intact to ensure genuine licensed, was the quality of the company's guarantee and after-sales service.